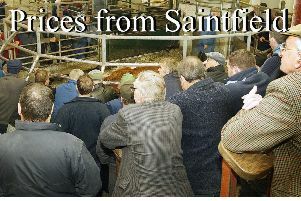 A small entry this week at Lisnaskea sold readily to a brisk demand with cows and calves selling to £1290 and £1120. Store Bullocks sold to £1065 for a 560kg Lim (£190) and £990 for a 460kg Ch (£215). Weanling steers and bulls sold to £790 for a 300kg Lim. (£263). SUCKLER COWS & CALVES: Magheraveely Producer 2010 Cow & Bull Calf to £1290. Derrylin Producer 08 Cow & Bull Calf to £1120. STORE & WEANLING STEERS & BULLS: Lisnaskea Producer 560kg Lim. to £1065 (£190), Magheraveely 460kg Ch. to £990 (£215), Newtownbutler Producer 300kg Lim. to £790 (£263) 290kg Lim. to £695 (£239) and 360kg B/B. to £750 (£208), Rosslea Producer 340kg Ch. to £745, Newtownbutler Producer 330kg Lim. to £700, 350kg AA. to £600, and 270kg Her. to £460, Lisbellaw Producer 230kg Lim. to £580 (£252) and 200kg Shb. To £400. STORE & WEANLING HEIFERS: Lisnaskea Producer 490kg Lim. to £885 (£180) and 340kg Lim. to £600. Newtownbutler Producer 490kg Ch. to £830 (£169), Newtownbutler Producer 400kg Lim. to £710, 350kg Lim. to £690, 310kg Lim. to £635, 330kg Lim. to £615, 250kg Lim. to £565 (£226) 270kg Lim. to £530, 260kg Lim. to £505 twice, Lisbellaw Producer 240kg Ch. to £600 (£250) 280kg Ch. to £575, and 250kg Ch. to £520, Kinawley Producer 250kg Lim. to £555 (£222).